The simple act of smiling sends a message to your brain that you're happy. And when you're happy, your body emits feel-good endorphins. When you have good dental care, you tend to smile more often, thereby making your life pleasurable. Now, dentists are utilizing robots to help keep you smiling. Did you know that smiling also triggers activity in your brain? In your left frontal cortex, there's a significant mind-body connection, which is in the area of your brain that registers happiness. So, let's get happy and see how robotics helps dentists give you that smile. Hopefully, your dentist is well educated in teeth and how to fix them. 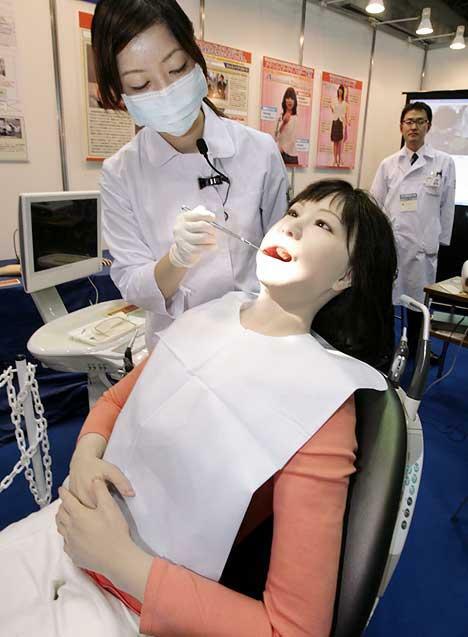 To assist in the training of a dentist, the Japanese invented Simroid, which is a humanoid practice robot. It alerts dentistry students if it is uncomfortable. From a distance the Simroid looks like a petite Japanese woman, dressed in a pink sweater. On closer inspection, you realize the woman is a robot. The Simroid's teeth are fitted with sensors and the robot will cry out when the dentist's equipment touches the virtual nerves. The aim of Simroid is to train dentists to detect if patients are comfortable, and not just focus on technical proficiency. Now, don't you feel better about sitting in the Dentist's chair? During some dental procedures, the dentist uses anesthesia to numb the area of the mouth, such as when performing an extraction. Nanobots can be used to induce anesthesia. The gum of the patient is instilled with a colloidal suspension containing millions of active, analgesic, micron-sized robots that respond to input supplied by the dentist. Once in the gum, nanobots shut down all sensations by establishing control over nerve-impulse traffic in any tooth that requires treatment. After the treatment, the nanobots restore sensation, providing the patient with anxiety-free needleless comfort. The anesthesia is fast-acting and reversible, with no side effects or complications associated with its use. Nanobots can also be used for the detection of bacteria, viruses and DNA, and assist with the diagnosis of oral cancer and diabetes mellitus. Nanobots can be programmed to penetrate cancerous lesions, identify neoplastic cells and destroy them by increasing the intracellular pressure or temperature utilizing focal lasers, microwaves or ultrasonic waves. 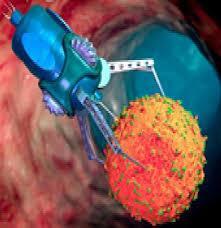 The above picture shows the Nanobot attacking an oral cancer cell. 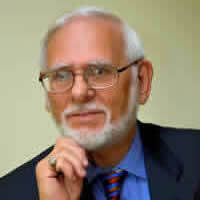 According to W.H.O., the main cause for deaths now-a-days is cancer. The traditional methods used in the treatment of cancer are radio therapy and chemo therapy. But the patient undergoing this treatment has to bear lots of pain and side effects like fatigue, hair loss, weight loss etc. To avoid this, researchers have now come up with the idea of using nanobots in treatment of cancer. By using nanobots, a cancer patient can be cured completely without any side effects. This is an innovative approach to build, control, and monitor a medical nanobot in diagnosis of cancer from its early stage before metastasis. In future, orthodontic nanobots could directly manipulate the periodontal tissues, allowing rapid and painless tooth straightening, rotating and vertical repositioning within minutes to hours. 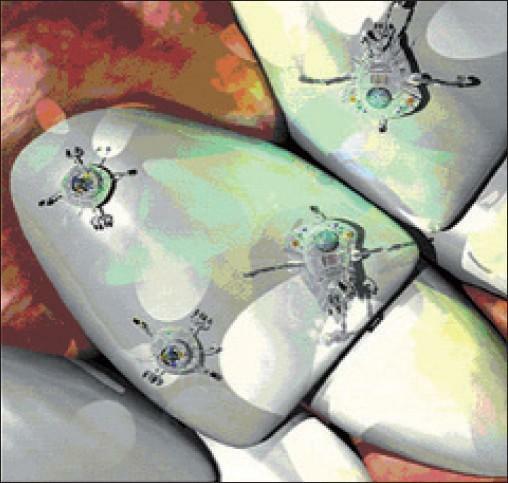 Nanorobots can identify teeth with hypersensitivity and seal their dentinal tubes with desensitizing agents. This would offer immediate and long-lasting relief to the patient as compared to conventional methods. Dentin hypersensitivity may be caused by changes in pressure transmitted hydro-dynamically to the pulp. This is based on the fact that hypersensitive teeth have eight times higher surface density of dentinal tubules and tubules with diameters twice as large as non-sensitive teeth. Dental nanobots could selectively and precisely occlude selected tubules in minutes, using native biologic materials, offering patients a quick and permanent cure. The duration of orthodontic therapy may be dramatically reduced by nanobots, which can manipulate the periodontal structures, including gingiva, periodontal ligament and alveolar bone, thus doing away with the need for wearing appliances for prolonged periods and minimizing patient discomfort. While implant surgery may never be fully automated with robotics, robots can be used for preoperative planning, as well as the surgery itself. The purpose of using a robot to assist in dental implant surgery is to automate the drilling route involved with the procedure. The benefits of using a robot are generally a safer procedure, more precise drilling, and faster healing times. Researchers are able to produce a digital 3-D map of the teeth. Using this 3-D map, a route for a robot to drill can be planned. The robot used for this procedure is an industrial type called the Denso. A significant issue, facing implant dentistry, is pre-surgical determination of the most favorable location, angulations and depth, with which to place an implant. 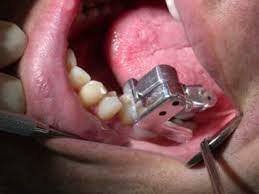 Dental surgical guides are used to carefully consider these essential decisions prior to dental surgery. A 3D Printer is used to create surgical guides to assist with pre-surgical planning and provide inter-operative positioning verification. 3D printed surgical guides are fully compatible with conventional CT scanners and the new low-radiation conebeam CT scanners. After the scan is taken, the data is converted to STL format in order to start the planning. Models produced on the 3D Printer provide exceptionally fine detail and an outstanding surface finish, ensuring the high degree of accuracy required to meet the high standards of an implant procedure. 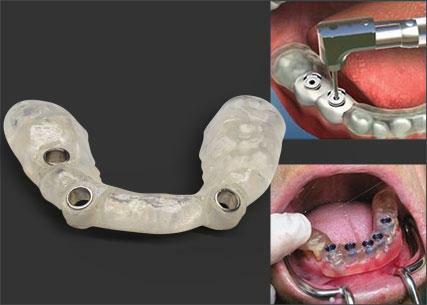 3D printers are working along with dental robots to help with modern dental procedures. 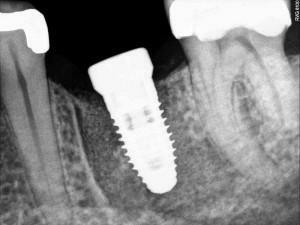 One dental procedure feared by all is the root canal. To help with this, a visually guided robotic system will be mounted on the teeth within patient's mouth, while a robotic controller and a root canal image processor share control over its motion. With on-line monitoring and positioning control, the multipurpose robotic system will perform automatic treatment procedures, including probing, drilling, filing, cleaning and filling. Nanodentistry could be the future of dentistry. All procedures could be performed using nanobots. In fact, nanobots may take the place of dental assistants. Diagnoses could be performed by nano-devices that would be able to not only diagnose the problem but give a solution in a short period of time. We should see these advancements within the next decade or two, while some nanobotic technology is being used today. We will see dentirobots help destroy harmful bacteria, preventing tooth decay, cavities and gum problems. We will no longer fear a visit to the dentist.